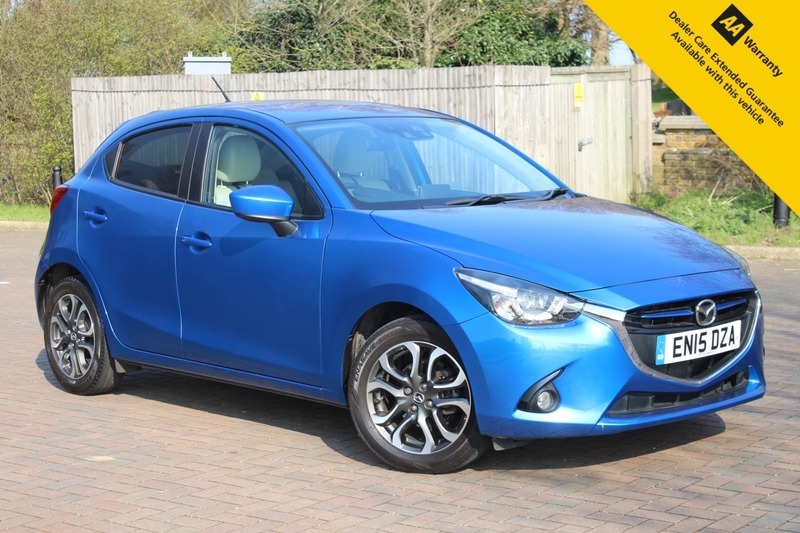 Here for sale at Leigh Cars Ltd we are delighted to present this IMMACULATE 1 OWNER FROM NEW Mazda 2 1.5 petrol 115 Skyactiv-G Sport Nav 5dr finished in brilliant vibrant metallic blue. The Sport Nav model comes with an unrivalled specification list including electric windows and mirrors, climate control, auto lights + wipers, cruise control, bluetooth connectivity, sat nav, rear parking aid, keyless start, alloys + much much more. This particular example also comes with £1730 factory options including light stone leather with heated seats and safety pack, which makes this car stand out from the standard specification and truly is unique. This beautiful example has a SUPERB FULL MAZDA SERVICE HISTORY - 3 stamps in total - last serviced at 23k. It also comes with a brand new ADVISORY FREE MOT - EXPIRY APRIL 2020. This fine example is in beautiful condition inside and out and has been maintained extremely well, the leather is in perfect condition. The interior and exterior of the vehicle have been Supagard Paint & Leather Protected from new so it really is in mint condition. This car is perfect for a growing family or maybe someone looking for a fantastic low mileage 5dr hatchback with an abundance of specification. This car will only cost £30 per year to tax and will return you an average of 56.5mpg, so is nice and economical to run for anyone concerned about ongoing running costs. it truly is a unique car with this extra specification, with faultless interior and exterior and a superb drive we would strongly recommend a test drive to see for yourself, so what are you waiting for, book in your test drive today?